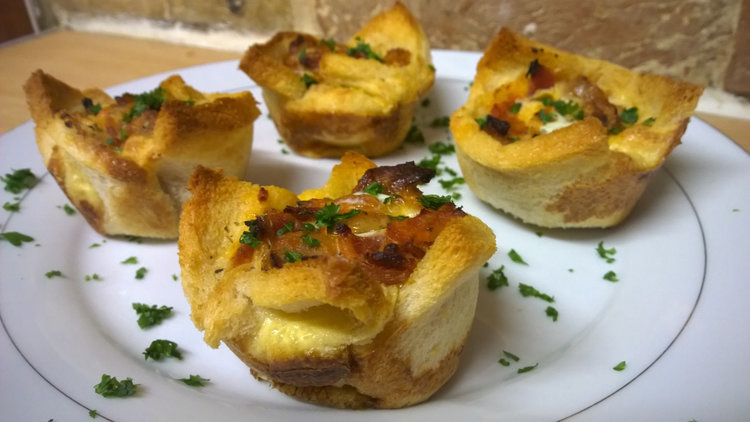 How about these for a tasty and fun brunch item? I took inspiration for these from a recipe I saw here which uses a chicken, sweetcorn, and mayo filling. I made those (although I used fresh ingredients rather than the canned chicken/corn/mayo product they use on there), and it was nice, but I felt that as the outside was basically toast, the idea would lend itself better to a breakfast/brunch recipe, so I devised this version instead, and it’s rather yummy if I do say so myself! You could make a vegetarian version of these, perhaps with vegetarian sausage and mushrooms – aim for a generous cup and a half of whatever you’re using, cooked first. 1. Spray non-stick cooking spray into a 12 hole muffin tin. 2. Cut the crusts off the bread and lightly butter the slices (this helps to create a barrier to stop the bread getting soggy from the filling). 3. 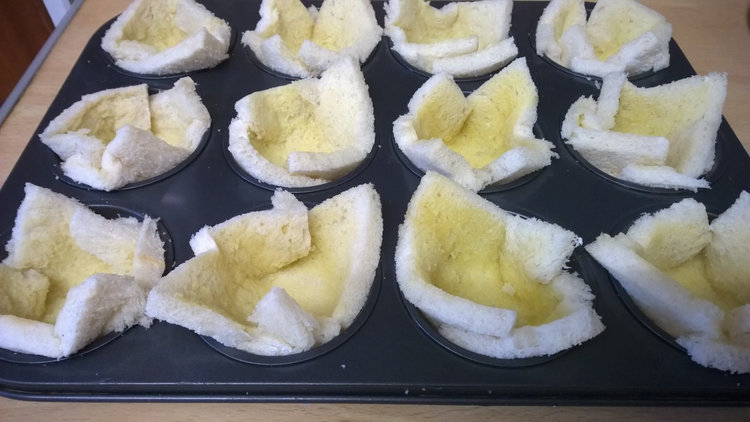 Gently press the slices into the muffin tins. Take care with this or you’ll make holes in the bread. The fresher the bread, the easier it is to shape it into the tins without it tearing. 4. 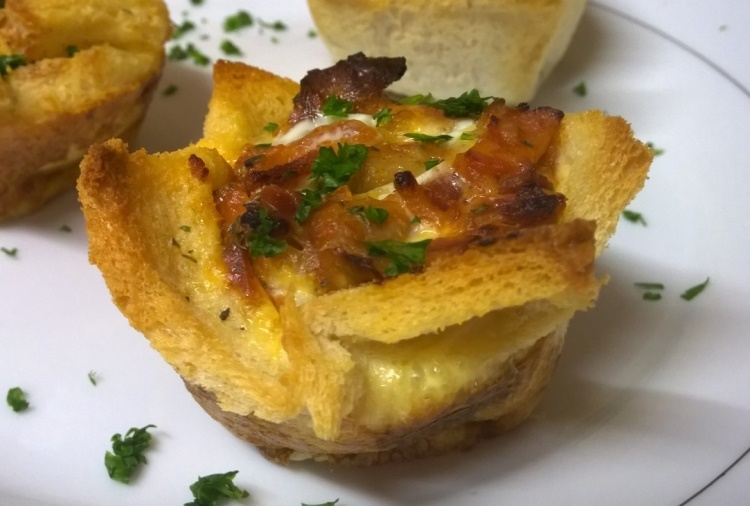 Mix the sausage, bacon, and salsa together and divide it into the bread baskets. 6. Beat the eggs, milk, and herbs together. Very lightly season it with some salt and pepper, you don’t need much because there’s plenty of salt especially in the sausage, bacon and salsa. 7. Pour the egg into the baskets on top of the sausage mixture. If you pour a little into each one and leave it for a minute, it will seep down and you’ll be able to add more in. You should be able to use up all the egg mixture. Don’t worry if some of it goes over the top of parts of the bread and down the outside of it, it just creates a nice french-toasty effect on the outside. 8. Cook in a preheated oven 200C/400F for about 15 minutes until hot, golden and crispy. Sprinkle with chopped parsley. Serve right away. Oh really! I hadn’t come across them before. Yes, a good way to use up left over meat and whatever. I plan to try different versions. I would like to use diced/broiled Turkey instead of sausage to enjoy the spirit of festival. Happy Thanksgiving! Ah yes, good idea! I’m in England, so we don’t have Thanksgiving here, but you’ve given me an idea for doing these the day after Christmas day, with left over turkey and stuffing/dressing, cranberry sauce etc. Cute and clever! And I bet they smell wonderful coming out of the oven. Ooh The Cheesecake Factory! I LOVE The Cheesecake Factory but they don’t have it England – there have been rumours of it coming to London, but I think they have been any more than rumours thus far. The only place I’ve been to it is in Vegas. Your secret’s safe with me…muahahaaaa!!!! Sorry to disappoint you, but I did remove the crusts! I think because the edges go darker anyway, they might just burn if you left the crusts on. But really they don’t take long to make, quicker than I expected really. I like this one very much Vanessa and may give it a go over the holiday season. Thanks so much! I am going to try the vegetarian version so hopefully the mushrooms won’t make them too watery. Oh yes, definitely cook the mushrooms first to avoid the watery leakage in there! Sorry my last comment sounded rather bossy didn’t it! Haha. I’m going to try this one today with scrounged leftovers. Looks great! Hope you liked them if you made them! Vanessa, since my last visit here, I did give these a go. Yum! Thanks for the inspiration. Oh good, I like hearing when people have tried things out!